Book a private party minimum of 7 or more. We have space for up to 30 people at one of several studio’s on Webster Street in North Tonawanda, NY 14120. 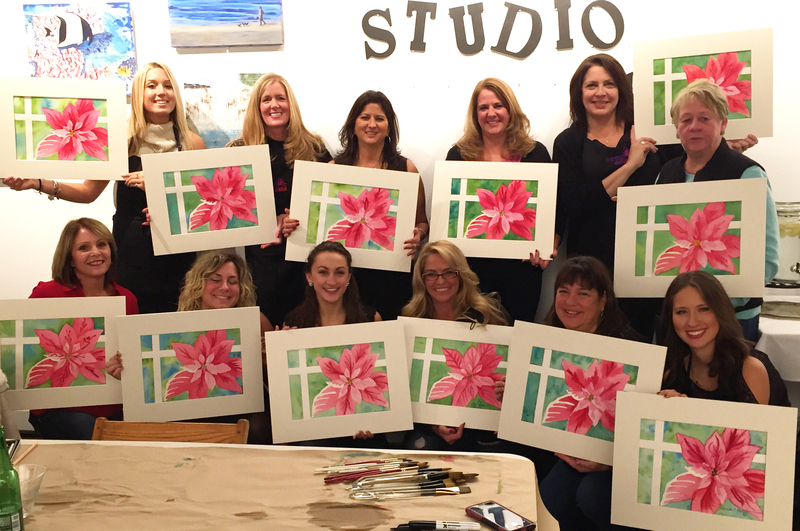 With a private party you have control over the date/time and choice of painting theme. The medium is Watercolor on watercolor paper NOT Acrylic paint on canvas. Each design/theme is drawn ahead of time onto high quality French watercolor paper. Professional grade watercolor paint and brushes are used. When complete, each painting is ironed to flatten from the painting process, mounted and matted using professional quality banbridge mat board suitable for framing. Clear sleeves are provided as well for transporting your masterpeice. The cost is $35 per person. This includes step-by-step instruction and all painting supplies. Upon completion each painting is ironed, mounted and matted and placed into a clear sleeve for transporting. For parties of 12 or more the cost is $25 per person. This includes step-by-step instruction and all painting supplies. Upon completion each painting is ironed, mounted and matted and placed into a clear sleeve for transporting. NOTE: Not all painting themes are suitable for this size. 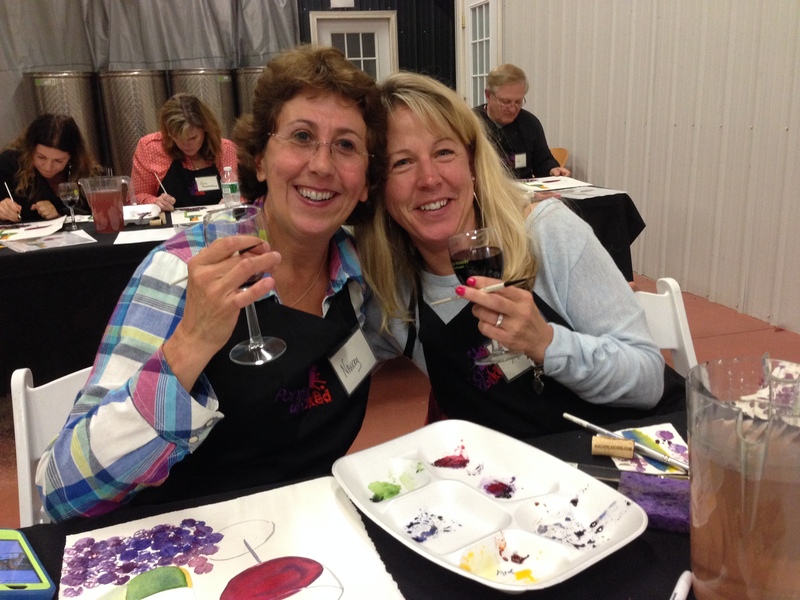 For parties of 16 or more – we can discuss finding the right venue for your group. 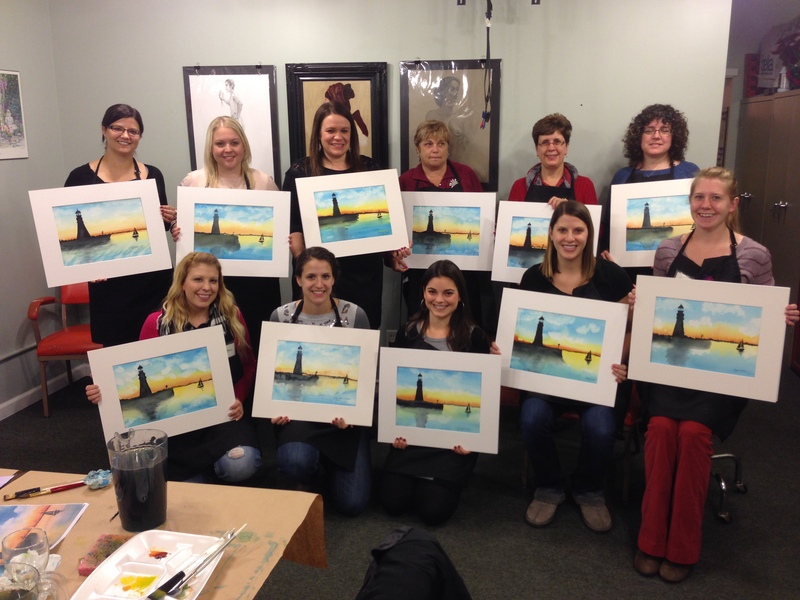 painting themes or we can customize one to fit your occasion. A $100 deposit will secure your date. We require a minimum of 10 people – if this requirement is not met the host credit card or check will be charged for the balance to meet the requirement. There is a 7 day cancelation policy. Participants can register and pay online for the private party. We can also notify you as to who and how many have signed up..
limited to wine and beer. (no one under 21 will be allowed to consume alcohol) The events are also BYOS (bring your own snacks) to enjoy while you are uncorking your creativity. We encourage fun, laughter and socializing to make this event special for everyone! Birthday, Bachelorette, Corporate, or what ever the occasion. We will make sure it will be fun for everyone!